While that’s certainly good news, mirrorless is basically trending where it’s been for the last two years, while the Canon/Nikon DSLR dominance is slowly coming downward. While I was off for the month, apparently a few blogs picked up on the mirrorless gain and proclaimed a victor. It’s not as simple as that, though. Since shipments tend to occur significantly prior to announce/launch, we probably should include the Nikon D810 in the DSLR category and the Pentax Q-S1 in the mirrorless category for the first half of the year. It’s also possible that Olympus E-PL7’s and a few other mirrorless could be in the late first half 2014 shipments. Basically, more new mirrorless cameras appeared, so the shipments should be higher. I think the CIPA numbers are showing a secondary factor: staleness. 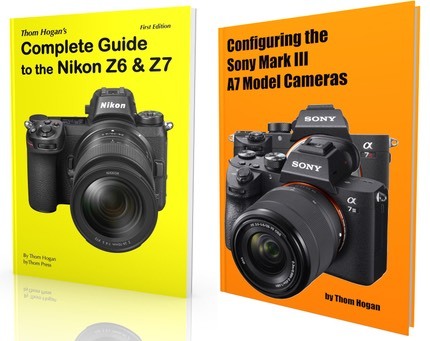 Two of the three DSLRs shipped during this time period were iterative updates of cameras whose previous generations are still in stock and competing with them. The other DSLR was a low volume professional DSLR that didn’t add much to the one it replaced. Meanwhile, in the mirrorless category, we had the two leaders, Sony and Nikon, produce new generations of their products with some interesting and significant changes, plus upstarts Fujifilm and Olympus lobbing in very interesting cameras that pretty directly compete with those low-end DSLRs that have gotten stale. Simply put, there was a lot more than simple iteration going on in the mirrorless world in the first half of the year, while the DSLR world was mostly just very modest generation iteration. I wouldn’t expect the DSLR sales to be pushing higher based upon what new products came into the market. On the other hand, I can see how that would happen with the mirrorless products, especially since we have more “eagerness” there to propel those companies. In particular, Sony seems to be highly optimistic about their mirrorless cameras at the moment, and it’s possible that they are overproducing them to demand. Or that demand is up because the products are so good. It’s always easier to analyze these things in retrospect, and pick out the real change that compelled the trend. 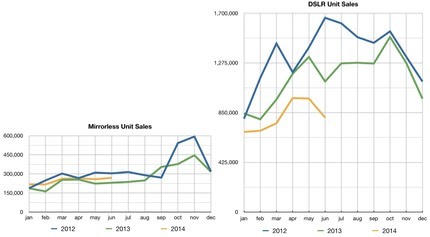 I think it a little premature to say that mirrorless is going to overtake DSLRs. Even if that does happen—which I’ve been predicting will eventually happen due to the simple need to reduce complexity in products—on the current growth path Canon and Nikon have quite some time to prepare a response. Overall, the camera industry is still being hit hard by decline. Outside the industry, everyone seems to get hung up on unit shipments/sales. But the real issue is much more simple: in 2012 the total CIPA-reported sales volume was well over 2t yen. In 2013 it was something like 1.7t yen. For the first half of 2014 it was down to just over 0.6t yen, and even applying a second half surge for Christmas sales, one might expect the total to be no more than about 1.5t yen. Yet there are the same number of players in the market as before, all chasing profits on those declining sales. Which means that, to keep your head above the water by the same amount, you need to shed costs. Canon and Nikon have done a good job of doing just that, actually increasing profits on declining volumes, which is a pretty tough thing to do. But you can’t do that forever, and it’s a bit like trying to control a tail spin. Eventually you need something to gain lift and control with and begin to recover lost altitude. Mirrorless sales aren’t popping. They’re staying in a fairly narrow margin, better than last year, worse than the year before. That’s not enough lift, I fear. At least for the moment there won’t be a crash, though.